About 4.6 million Indian women were sterilised in 2011 and 2012.One doctor conducted 83 operations with one instrument in five hours in a bid to check India's 1.3 billion population from growing further. India has the dubious distinction of having the highest number of fatalities in road accidents in the world - over one lakh deaths every year. It, therefore, stood to reason that a major effort was needed towards improving infrastructure as well as providing superior safety features for vehicles. OVER the last few decades it has been an open season on Jawaharlal Nehru. There has been no let-up in the campaign to denigrate him as much as he was adored in his life for devoting it entirely to the service of the country of a quality that has had few parallels. Of course, Nehru was not infallible. It was just a week ago that I had the privilege to witness a fascinating military ceremony on the India-Pakistan border — the retreat at sunset. Dashing members of the security forces of both countries, in their immaculate distinctive attire, marched in unison to an orchestra of parade music. Ever since Halford Mackinder's Russia containment strategy disguised as a grand theory first appeared, the Eurasian heartland has been perceived by the Anglo-American world as a threat to their global position and interests. Ironically, when Mackinder was writing his paper, The Heartland Power, czarist Russia, was on its death throes. Japan's 1904-1905 naval victories in the Pacific over Russia removed all illusions about Russia's status as a first-rate power. Yet, within three decades, revolutionary Russia had re-industrialised and was emerging as a potential superpower. About 4.6 million Indian women were sterilised in 2011 and 2012.One doctor conducted 83 operations with one instrument in five hours in a bid to check India's 1.3 billion population from growing further. This shocking feat was performed in a hospital at Pendari village in Bilaspur district of Chhattisgarh, which lay abandoned for over a year and hence did not meet the specified medical guidelines where laparoscopic tubectomies were performed. Precious lives were lost and some were rendered seriously ill. Women were operated upon despite being diabetic, asthmatic or suffering from cardiac problems. The shocking state of affairs of the government-run target-oriented sterilisation programme has bared inhuman treatment and apathy. Poor women are offered an incentive of Rs 1,400 each to undergo sterilisation, risking their lives. Unfortunately, the mother and child care network in the healthcare system makes it easy to persuade women through its large number of field workers to bear the burden of family planning. Men fear they might lose their virility by undergoing vasectomy, which is an easier and less-risky procedure. 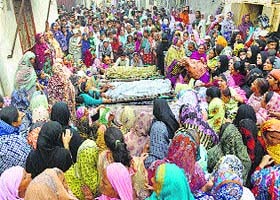 Some 96 per cent of all sterilisation surgeries are done on women to save men from losing their ‘manliness.’ Sterilisation deaths are not a common phenomenon, especially since the infamous “nasbandi” programme of the government between 1976 and 1977, which accounted for 8.3 million sterilisations, conducted mostly under coercion. Since then no government has pushed the family-planning agenda. Viewed in the context of our poor record in maternal health care, among the worst in the world, with 200 women dying during pregnancy for every 1,00,000, compared with just 37 deaths in China, the complete picture that emerges is that of neglect. This is so when India has one of the world’s highest rates of sterilization among women, with 37 per cent undergoing such operations compared with 29 per cent in China, another populous country. It's time the government lifted this burden from the already burdened shoulders of women by promoting contraceptives on a war footing. India has the dubious distinction of having the highest number of fatalities in road accidents in the world - over one lakh deaths every year. It, therefore, stood to reason that a major effort was needed towards improving infrastructure as well as providing superior safety features for vehicles. This is far from the case as the recent crash safety tests by the Global New Car Assessment Programme (Global NCAP) have shown. Both Maruti Swift and Datsun Go have failed the test. This was the second round of tests by the safety watchdog. Tata Nano, Ford Figo, Hyundai i10 and Volkswagen Polo were tested earlier, and these, too, had failed the test. The tests are conducted at 64 km/h, which the Indian manufacturers claim is too high for India, given the bad conditions of roads, traffic, etc. The argument does not hold much ground since safety is built to take care of exceptional circumstances, and the global tests are widely recognised as the standard for vehicle safety. Even then the announcement by the Ministry of Road Transport and Highways that it will be mandatory for cars to undergo a frontal crash test at 56 km/h from October, 2015, is welcome. While the test will be conducted at a speed lower than what is suggested by the Global NCAP, it is a major step forward. The safety of drivers and passengers rests largely on devices like seat belts and air bags. While seat belts are compulsory, air bags are given as extras. Indeed, safety should not be an option. All the cars tested came without air bags. Volkswagen Polo now comes with air bags as a standard fitting and this has improved its ratings. India has woken up to the need for better safety features in cars. The government has announced some measures, but it is for the manufacturers to be proactive in providing safety to the customers, and for the customers to invest in safety by buying cars that have a high-safety rating. TWO years ago, His Excellency Lord Hardinge publicly called the attention of the cultivators in the canal colonies of the Punjab to the dangers of over-irrigation. Since then the question of preventing the evils of water-logging has been more than once referred to by His Honour the Lieutenant-Governor in the Local Council, but it is doubtful whether the cultivators themselves have adequately realised its importance. None the less it should be recognised that the economic prosperity of the Province depends largely on the successful solution of this difficult problem, and it was this recognition on the part of the Government of India which lately resulted in the deputation of Mr. Nethersole, Inspector General of Irrigation, to study the American methods of economising water in canal irrigation. THE Indian Epics and Puranas are full of details regarding the training that was given to the sons of Kshatriyas or the ruling castes. The preceptors were great warriors and learned Brahamans. Each student was taught separately in the art of offence and defence and in the use of the bow. But just before the Christian era, a writer in the "New Delhi" points out, there were regular military schools in the Kingdom of Kerala or the modern Malabar. The fighting races were regularly recruited and trained in these schools. In front of each military college was erected a temple of the Goddess of Victory and this deity was worshipped by every student and there were festivals connected with the worship. The writer also refers to the existence of an Army Council who maintained the required arms and war materials and the members of this Council were elected by the people for a few years. OVER the last few decades it has been an open season on Jawaharlal Nehru. There has been no let-up in the campaign to denigrate him as much as he was adored in his life for devoting it entirely to the service of the country of a quality that has had few parallels. Of course, Nehru was not infallible. Like all human beings he erred, sometimes badly, his worst error being on China. To criticise these mistakes is one thing, and to run a virtual crusade to make out that he is responsible for everything that has gone wrong in India quite another. There have been two main forces behind this untenable, unfair and deplorable campaign calumny. The first is a combination of those innocents, most of them born after his death, who worship free market and globalisation, and blame Nehru for not doing this from day one because they know not what India was like at the time of Independence and what Nehru did to uplift the country politically, economically and in every other way. Even more malicious and wilful is the second horde of Nehru-baiters, consisting largely of those Hindutva hotheads who felt frustrated because the harder they tried to erode his legacy of secularism, the greater was their failure. Since the BJP — with a clear majority of its own and a huge one with its allies - has come to power, the Hindutva extremists have felt encouraged and have indeed got away with some of the most provocative, polarising and divisive statements. Leave alone the second-rung leaders like Yogi Adityanath or Sakshi Maharaj, even the head of the Sangh Parivar, RSS chief Mohan Bhagwat, has proclaimed magisterially that everyone who “lives in Hindustan is a Hindu”. Someone should teach this gentleman that denizens of Hindustan are Hindustanis, including Hindus, Muslims, Sikhs, Christians, Parsis et al. So far Prime Minister Narendra Modi has done little to restrain bigots. However, one hopes that he would soon realise neither development nor governance would be possible should his lunatic followers succeed in starting a violent conflict based on religion. It is an encouraging sign that the Prime Minister has persuaded the extremists to give up the demand for the building of the Ram temple at Ayodhya by a certain date. At the same time it is most disconcerting that Giriraj Singh, a BJP leader from Bihar, has been included in the 21 new entrants into Mr Modi’s Council of Ministers. He is the man who, during the general election campaign, had made the reprehensible statement that those voting against Mr Modi had “no place in India, and must be sent to Pakistan”. He never withdrew this statement. Instead, he repeated it more emphatically. The then BJP president and now Home Minister, Rajnath Singh, merely “disassociated” his party from the offensive statement for which he should have been reprimanded. Now he has been rewarded. Against this backdrop, what a joy it is that during the discussion in the run-up to Nehru’s 125th birth anniversary, the reality about his titanic and many-splendoured personality, warts and all, has become known to the generation that is below 35 and constitutes two-thirds of the country's population. Let me try and sum up what has already been said either in print or on TV. Surely, there is criticism of him and some of it valid. But there is a consensus on several points. The most important of these is on the point that Jawaharlal Nehru was the second greatest Indian, next to the Mahatma, in our time. No doubt there were other stalwarts of the freedom movement who joined him to provide collective leadership to the country. They included Vallabhbhai Patel, Maulana Azad and C. Rajagopalachari, better known as Rajaji. Except for Patel, no one was his near-equal. Indeed, it is no exaggeration to say that from August 15, 1947, to December 1950, India was ruled by these two men, popularly known as “Panditji” and “Sardar”. It was equally clear that these two men were so greatly unlike each other in outlook, ideology and even ways of working. They often quarrelled, sometimes even on petty administrative matters, but in the service of the country they were at one. Both were equally patriotic and men of sterling integrity. In brief, in defending national interest they were like the two yoked bullocks that was then the election symbol of the Indian National Congress. After Patel's death, in the words of Nehru's official biographer S. Gopal, it was a “one-man show”, though Nehru greatly respected the Maulana and relied on his sage advice. In a relatively short period Patel defeated Nehru twice: first by getting Rajendra Prasad elected as President instead of Rajaji, who was the first Governor-General after Mounbatten left in 1948, and Nehru’s candidate for the presidency. Secondly, he saw to it that the highly conservative Purushottam Das Tandon became the Congress president by winning the election for which Nehru’s candidate was Acharya Kripalani. Let me come to the basic point. The Mahatma was India’s liberator. 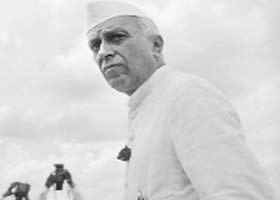 Nehru was its moderniser and the founder of its secular and “socialistic” democracy. He also laid deep foundation for the spread of science and technology. But for his grand vision that he implemented immediately, we could not have become a nuclear power when we did or succeed so brilliantly in our mission to the Mars. We are the world's largest democracy because he built it. Sadly democratic standards have deteriorated since his time. As for his economic policy that is under sharpest attack, the subject is so vast that it will have to be discussed separately. But let me use the available space to make just one eloquent point. During the British time, from 1857 to 1947, India’s rate of growth was 0.7 per cent. Nehru raised it to 3 per cent throughout his era. If his successors failed to raise it further, he cannot be blamed. It was just a week ago that I had the privilege to witness a fascinating military ceremony on the India-Pakistan border — the retreat at sunset. Dashing members of the security forces of both countries, in their immaculate distinctive attire, marched in unison to an orchestra of parade music. On opposite sides of the zero line, thousands of spectators thronged their designated enclosures to view a real-life drama from close quarters. Thanks to the civility of some officers on duty, our little group of visitors could enjoy the proceedings from the ring side. The precision and fervour with which the Indian Border Security Force and the Pakistan Rangers raised their heels to the shoulder level was matched only by the ferocity of the glare with which their eyes confronted their colleagues across the line. A doctor friend in our party expressed serious concern that the fabled kicks in the air, so sweetly timed, might damage many ankles and knees, besides subjecting the handsome soldiers to hamstring injuries. The brave protagonists were, however, oblivious to any such risk to limbs. For them it was a routine; the exercise delivered to the viewers an experience of a life time. A short parade followed by the lowering of the national flags to the buglers’ synchronised call to retreat brought the spectacle to a solemn close. Our eyes were moist as the local commander folded the Indian Tricolor with reverence. The common public participates rapturously in the retreat ceremony at Wagah, the border outpost. As the uniformed heroes seek to excel their peers in stride and stare, the lay audience displays equal zeal in dancing to the beat of patriotic songs, joining a loud chorus of slogans in worship of the motherland. It is as though the common citizens, mainly from Amritsar and Lahore, considered as twin cities before the dividing line between them was drawn in the year 1947, join a competition of decibels in intensity of sound. Watching the faces of the crowds in the opposite enclosures, one sees great merriment and cheer. So similar is the tone and appearance of the unknown ambassadors in the two galleries that one can be faulted for imagining that they are the dramatis personae of a scripted play, all performing in a jovial theatric presentation. If the Rangers in the parade stand slightly taller than their Indian counterparts, the women warriors of the BSF, who offer the first salute, prevail with soft power. On the Indian side numerous women from the spectators are uninhibited as they perform a spontaneous dance just before the main ceremony. Despite a cacophony of shouting, and efforts to outdo the other side in sound and rhythm, bonhomie between the two teams pervades. The line separating the people from each other could well be imaginary. Alas! The idyllic camaraderie of two nationalities, has just been suddenly, and rudely, shattered. Grotesquely, the tragedy struck at the very venue, and at the very hour, where harmony has been demonstrated unfailingly over decades. Perhaps an evil eye has been cast at the cheerful atmosphere at the historic site. The slaying of so many innocents, who had come merely to celebrate commonalty with their comrades of the neighbouring nation, is a reminder that terrorism abhors friendship and understanding. A challenge now beckons both nations. How quickly can we revive the fun and frolic at our borders? 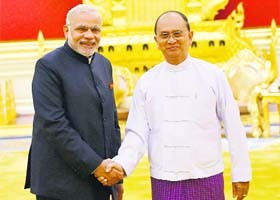 PM Narendra Modi greeting U Thein Sein, the President of Myanmar at the presidential palace during his recent visit to Myanmar. 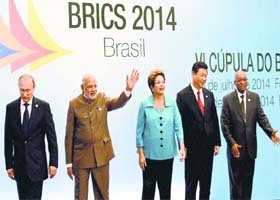 India lays BRICS for a proactive role in foreign policy: (Left) President of the Russian Federation Vladimir Putin, Prime Minister Narendra Modi, President of Brazil Dilma Rousseff, President of People’s Republic of China Xi Jinping, and President of the Republic of South Africa Jacob Zuma, at the Sixth BRICS Summit, in Fortaleza, Brazil. Ironically, when Mackinder was writing his paper, The Heartland Power, czarist Russia, was on its death throes. Japan's 1904-1905 naval victories in the Pacific over Russia removed all illusions about Russia's status as a first-rate power. Yet, within three decades, revolutionary Russia had re-industrialised and was emerging as a potential superpower. Stalin's crushing, albeit costly, annihilation of Hitler's Third Reich established Soviet power and prestige as the second global pole. China's own revolution inspired and financed by Stalin's Russia produced the first major consolidation of the Eurasian heartland. The West led by America initiated a sustained grand strategy of countering this new force in world politics. Nicholas Spykman provided a theoretical precursor to this strategy in his 1942 book, America's Strategy in World Politics, which argued for America to project its strategic influence on the Rimland regions around the Soviet periphery. Middle powers like India, however, reacted differently and consciously chose an approach that sought to maintain friendly ties with both these formidable blocs. Despite some material costs, the overall developmental and security advantages of such an independent approach has never been credibly challenged. In fact, this notion of sustaining a balance between the Atlantic and Eurasian worlds became an ingrained feature of Indian thinking and foreign policy practice. During the interlude between 1991 and the resurgence of the Eurasian powers in the last decade, any notion of a balance between the two worlds became irrelevant. But the dramatic revival of the Eurasian world, and, its second phase of consolidation since the 1940s and 1950s has revived the logic of balance in world politics. How should India view the contemporary alignment of Russia and China? First, US policies have played an important part in driving Russia away from the West. But China's new identity as a great power seeking to improve its own bargaining equation with the US is also a factor in Beijing's outreach to Moscow. Gilbert Rozman of Princeton University perceptively notes, “Moscow and Beijing have disagreements about the future order they envision for their regions. But they agree that the geopolitical order of the East should be in opposition to that of the West.” Unlike the US, India has absolutely no problem with a stronger Russia and a Moscow buttressing its Asian identity. A Moscow-Beijing alignment, however, poses some challenges although not nearly as serious as this development is for America's global position. What are the implications of this global triangular development for India? A modicum of a balance of power is a positive development for the overall international system. The short history of unipolarity leaves no doubt about the adverse impact of an unrestrained superpower on the lesser powers. As Putin recently remarked, “The very notion of ‘national sovereignty’ became a relative value for most countries.” While India shares some values with the West such as a commitment to democracy and a liberal vision of a rule-based system, it finds many Western norms on global governance and managing international security often contradicting that liberal vision. A challenge to Western pre-dominance, and, certainly against its unilateralist urges, is not unwelcomed by the Indian strategic elite. At the regional level, the rise of China is producing a variety of challenges some evident, others still in flux. For example, China's evolving role beyond its core focus on East Asia is bringing new forms of Sino-Indian strategic interactions, especially in states that overlap the peripheries of India and China. Just as India is discovering the logic of multipolarity, smaller states in South-East and South Asia are also recognising the virtues of multiple options to advance their developmental and security interests. The foreign policies of Vietnam and Sri Lanka exemplify this. Both these states have lived under Chinese and Indian power for most of their existence and are seeking opportunities to make new friends. In the Sri Lankan case, it is Indian apathy and lack of statecraft that has enabled Colombo to acquire more than the usual maneuvering space. In Vietnam's case, it is the sheer consequence of China's growing power that is impelling Vietnam to pursue multiple strategic partnerships. Ironically, it is Moscow that has assumed the leading role in modernising Vietnam's military capabilities. For both India and China, the challenge is to ensure that their smaller neighbours remain at the very least non-aligned and sensitive to their respective concerns. India needs to rediscover a rich tradition of statecraft that had got subsumed in domestic instability and parochialism in recent decades. While the instinct for a balanced posture comes naturally to Indian policymakers, the pursuit of India's own interests has invariably been a more challenging endeavour. Indeed, this was always the most powerful critique of non-alignment: India got the meta-vision right but struggled with the micromanagement of its own interests and role. Yet, rather than focus on defining Indian interests clearly and sensibly, the contemporary narrative around Indian foreign policy typically revolves around challenging the meta-vision by posing absurd questions such as: “Will India will swing West or East?” This is the wrong analytical level to advance a debate on India's foreign policy. Only once Indian interests are defined can India pursue and defend these. On core frontier issues, India has recognised it needs to manage its disputes by itself. No great power can solve these questions for India. Fortunately, nuclear conditions have obviated several scenarios of conflict escalation on India's frontiers. As a territorial status quo power, India's future challenge is managing its stalemates with China and Pakistan, and, exercising political will if opportunities for genuine border settlements arise. On developing a framework for cyber governance, India does not agree with the US position. In the July BRICS summit at Fortaleza Modi noted, “BRICS countries, should take the lead in preserving Cyber Space, as a global common good.” On terrorism, beneath the veneer of a global consensus, India has found its partners have fleeting attention when it comes to operationalising a shared revulsion for cross-border terrorism. On global finance, the gradual trend line towards a multiple reserve currency system with an internationalising yuan offers benefits in terms of a less imbalanced and thus stable system, and, access to diverse forms of international capital. On the maritime commons, India has common interests with big trading nations such as US and China, who all seek security of shipping lanes, even as India simultaneously seeks to shape the geopolitics on its own maritime frontiers, which are in proximity to international shipping lanes. On energy security, India seeks to leverage Western technological advantages when it comes to tapping non-conventional hydrocarbons but also has more immediate interests with the energy rich powers such as Russia, Iran and Saudi Arabia. On pursuing new lines of communication to Eurasia, India has a long-term common interest with Iran and Russia, the two leading powers, to access that space. India needs a more sophisticated outlook and conversation on global and regional affairs, and, the skill and poise to both agree and disagree with a variety of great powers. US policies have played an important part in driving Russia away from the West. But China's new identity as a great power seeking to improve its own bargaining equation with the US is also a factor in Beijing's outreach to Moscow. On global finance, the gradual trend line towards a multiple reserve currency system with an internationalising yuan offers benefits in terms of a less imbalanced and thus stable system. The short history of unipolarity leaves no doubt about the adverse impact of an unrestrained superpower on the lesser powers. Globally, India is facing an interdependent world, but with the Atlantic and Eurasian great powers intensifying their competition over many issues and regions. Unlike the US, India has absolutely no problem with a stronger Russia and a Moscow buttressing its Asian identity. — The author is a research scholar at King’s College, London.